For the past three days, I’ve been holed up in a fairytale, also known as Český Krumlov, an enchanting little village on the Czech border about two hours south of Prague. Český Krumlov is lovely, with perfectly preserved Renaissance buildings rising up at every turn, a brightly colored castle watching peacefully over the village and a slowly flowing river sewing the town together. The town has remained largely untouched since its first building was constructed in the 1100s, managing to avoid major wars and any bombings or plundering. 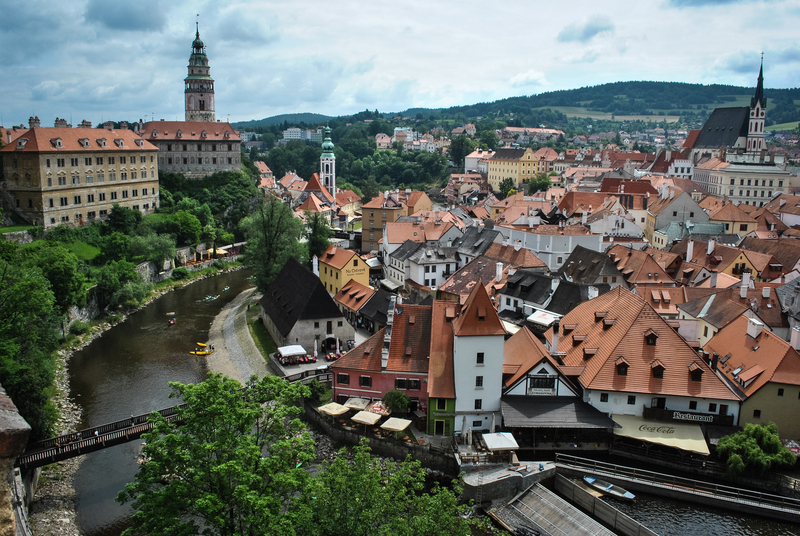 Because of its pristine history, Český Krumlov is an idyllic little Czech getaway. Most of the town depends on tourism, and so during the summer, all the shop and cafe doors are open wide to welcome the hordes of tourists. I heard several different languages, including Korean, Chinese, English, German and French, but I actually did not hear a lot of Czech, except from waitstaff or shopkeepers. Because it depends on tourists, the village has made itself into an entertaining, charming, relaxing little escape, with plenty to see and do in three days, including shopping, hiking, eating and wandering. The cobblestoned streets, which were more like twisting alleyways, were lined with ice cream parlors or windows from which to order trdelník, a sweet, cinnamon-y bread treat. Several restaurants also offered authentic Czech cuisine, including goulash, bread dumplings, pork roast, sauerkraut and the national pride, Pilsner beer. Český Krumlov offers more than just good eats, however. While the town is small, there is still adventure to be had. My classmates and I took a tour of the Rosenberg Castle that overlooks the entire village and is still in stunningly perfect condition. The last family to live in the castle deserted it as they fled World War II, leaving most of their valuables behinds. One of the best parts of the castle is the tower, which, while it’s a steep hike to the top, offers stunning panoramic views of the colorful village below. We also rafted on the river for an hour and hiked up around the top of the village for some beautiful sunset views. Nightlife in Český Krumlov is also fantastic. When the sun goes down, the street musicians come out to play, serenading tourists as they wander over bridges and between the twinkle lights from restaurants and cafes that light our path. The weather cools, the sun lights the sky on fire and the village comes alive. We were staying on the major street in the center of town, so we could hear shouts of laughter, bursts of song and quietly chiming church bells ringing throughout the night. It was the perfect soundtrack to a lively three days. This little village can do no wrong. At every corner, Český Krumlov served us well, whether it was in ease of navigation, surprising us with fireworks the first night, offering up delicious crepes and croissants, providing breathtaking views or greeting us with smiling faces. I’m already planning my return visit to this colorful and charming Czech gem.